Vacant urban land abounds, often locked behind chainlink fences in neighborhoods sorely in need of green space and other amenities such as fresh produce. A multidisciplinary group (including a programmer, designer, and artists) formed 596 Acres to encourage communities to re-envision the possibilities for the vacant lots in their own backyards. 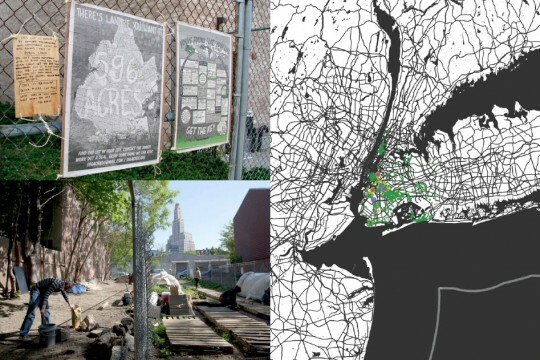 The name refers to the quantity of vacant city-owned land in Brooklyn, which the group catalogued, mapped, and printed on a poster that reads “Find the lot in your life. Contact the owner. Work out a deal. Grow something. We can help.” They hung the posters on hundreds of lots, prompting locals to action. Their interactive online map, combined with educational workshops, “labeling walks,” and more, have made 596 a valuable community resource.